Wonderful…a close-up and a full-length photograph…beautiful smile! natural beauty! love the bag! I like this look! And I need some pants like these. The whole ensemble rings as true as the gaze that compels you to only speak the truth to her. Perfectly finished off with the croc-embossed blunnies. Head to a bistro with a fireplace. The pants the jacket the bag the girl. Oh yeah. Looking cool. Totally with you, the boots, nah! Sure, she looks cool but you could possibly freeze around the navel with such a short crop to the jacket. Maybe you have to wear two or three cashmere tees under it. This outfit is possible because they don’t have labour day in France. 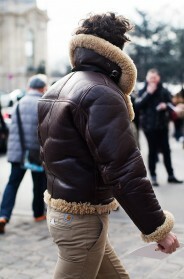 That shearling lining looks so cozy! I like the messy undone feel she has going. I wonder what the back of her pants look like with all that water on the ground. I have not mastered the art of winter whites because of slush. And I learned something new. That’s what cashmere tees are for! Love the look, especially the pants. Good use of a crop, to keep the pants from the slush. And it *is* flooding over there right now. 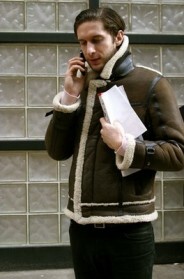 I want that jacket. Anyone recognize the brand? So much beautiful, bomber jackets in Paris. Bomber jackets is all time hot. very nice dress, thanks for sharing, nice job. very nice dress, thanks for sharing. nice job. very good dress, thanks for sharing.